It was 1989 and I was attending a tryout at a local college. I was up on the hill of the main field. There were four coaches sitting on buckets outside the dugout watching my every move while looking at their clipboards trying to find my name and pertinent information. Fellow players were sitting in the dugout sizing me up as their competition to make the team. And in the stands were a dozen parents doing the same. I finished my warm-up pitches and a batter steps in the box. Here we go…I take a deep breath and exhale and I start my windup. I bring my hands up to go over my head, right hand inside of my glove (which is how I began my wind-up ala Nolan Ryan), my glove hits the bill of my hat, pushing my hat back and off my head. I have no idea where my hat has gone. I just know it is not on my head any longer. I continue in my wind-up thinking the show must go on (big mistake!). I bring my hands back down from over my head. I separate my throwing hand from my glove to make the pitch, and at that point I find my hat. It is in my right hand around the ball. I continue to go through my motion, the show must go on (huge mistake! ), and I proceed to throw the pitch. The hat with the ball inside fly out of my hand and both land about ten feet in front of me, which is only about 50 feet shy of 60 feet 6 inches to the plate. Time stops, I hear nothing and tunnel vision takes over which I am sure is a way of self preservation from seeing the snickers and confused looks by all. Shocked! I have never done that before. I pick up my hat and the ball and get back up on the hill to complete my tryout. So Embarrassing! I finish my tryout and now can laugh about it. Tryouts can be so nerve-racking! Lefty is always nervous for tryouts. The idea of one mistake which could mean the difference of making a team or not is stressful. Just a few minutes and a few drills could represent the type of ball player he is perceived to be. I think it is pretty natural to be nervous during and before tryouts. I know I was, my hat-ball pitch is a good example. Lefty gets tons of nerves so here are a few things I do for him. He always wants to know what he will do in tryouts. He likes to know what he is in for. 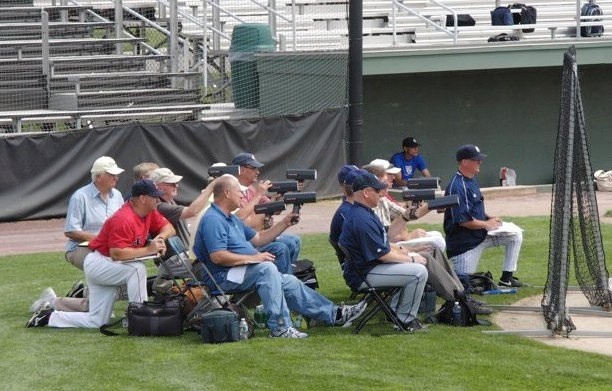 Most tryouts will be fielding a few ground balls and throwing to first, fielding a few fly balls and throwing to a base, hitting off a machine or live pitching, running the bases and possibly a few pitches to a catcher. Those are the tangibles. Those are the things we work on before tryout day. On tryout day, I don’t stress those things. I know Lefty is nervous enough, so I have him focus on things he can control, not whether or not he will boot a ground ball, swing and miss a pitch or pitch his hat. Here are 5 things I tell Lefty to focus on during the tryout. 1. First Impressions Matter – Show up looking and acting like a ball player. Wear baseball gear including shirt tucked in, hat on head and cleats. Dress the part. 2. Warm ups – Take warm ups seriously. Play catch with a purpose. When I watch tryouts, I watch how players warm up. Are they making good throws and catches. Are they goofing off or serious. Good ball players and teams play catch the best. 3. Hustle – Never walk on the field. Never. 4. Positive – Do not show frustration even if you make a mistake by pitching your hat. Forget About It! Show them how you will handle adversity. 5. Enjoy – Have fun. Coaches want to see you enjoy the game and that you are not being “encouraged” to play. After the tryout, no matter how it went, I remember to tell Lefty how great he looked and that I love to watch him play.